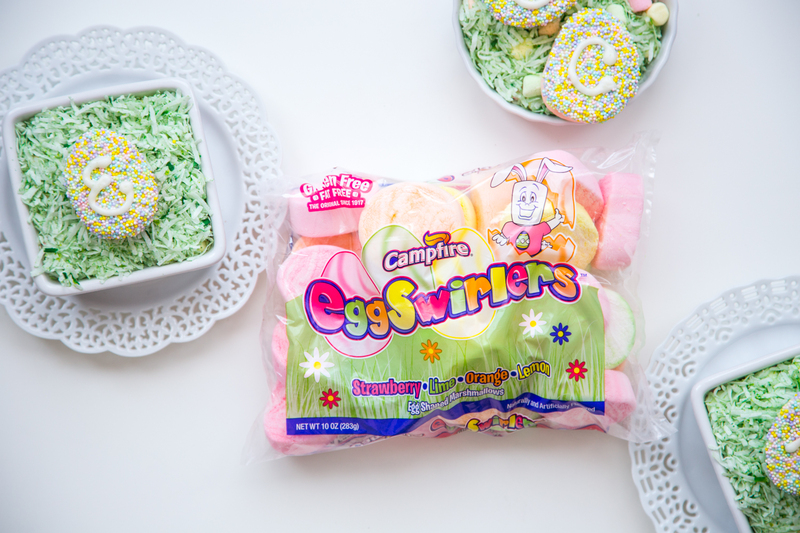 This post, Monogram Marshmallow Easter Eggs, is sponsored on behalf of Campfire® Marshmallows. All opinions are, as always, 100% my own. What a week this has been! I am slightly shocked that Easter is just days away. This whole time flying by thing is real, my friends. Oh, so real. Last week, Jamie and I were traveling to speak at some food blogging conferences to speak about making food videos (which I’m so into!). We spent the beginning of the week in Austin, which was a pretty cool place and had the most amazing weather! Sunshine never felt so good! On Thursday, we were supposed to travel from Austin to Charleston via Atlanta to speak at a second conference. Well, Atlanta weather had different plans for us and after a series of flight delays and cancellations, we missed the conference and ended up having to just come home. It was disappointing, but we were just so thankful that we didn’t get stuck at an airport and we realize it could have been so much worse. Now that I’m home, I’m realizing just how close to Easter we are and just how much I have not been preparing. Luckily, my family is pretty low key and we do our usual pot luck style holiday get together which I adore. I’m going to be in charge of deviled eggs but I haven’t decided which kind, yet! What should I make? Herbed Deviled Eggs, Nicoise Deviled Eggs, Spinach Bacon Deviled Eggs, Fig Deviled Eggs, Smoked Salmon Deviled Eggs, or the classic My Deviled Eggs? 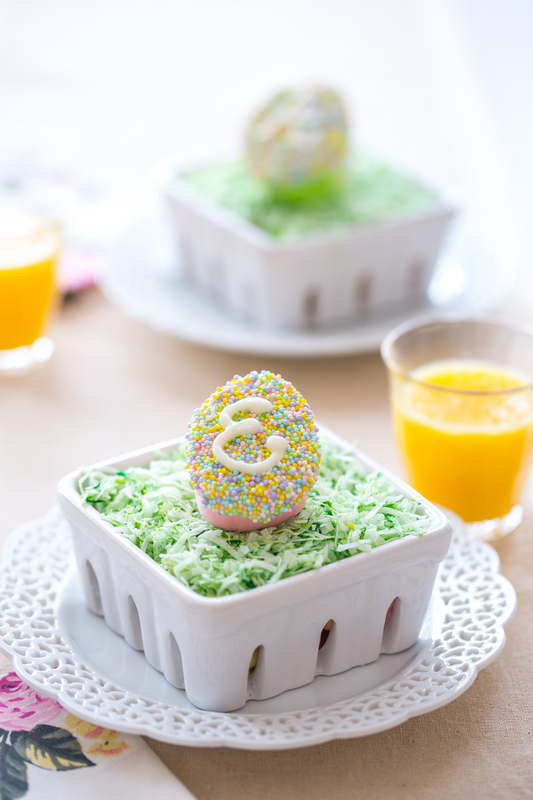 One egg that I know will be gracing our Easter Table are these totally adorable and borderline embarrassingly easy Monogram Marshmallow Easter Eggs. They use my very favorite Campfire® Eggswirlers! You might recognize these fruity, swirled egg shaped marshmallows from years past (Fruity Mallow Cups, No Bake Marshmallow Cheesecakes, Marshmallow Easter Eggs). The texture of these marshmallows are like pillows, they are so soft! And the flavors are hands down, my favorite. The orange tastes like a legitimate creamsicle and I am super into it. This year, I wanted to play around with dipping them in vanilla candy coat, similar to when I made my Marshmallow Easter Eggs. The flavor of the vanilla candy coat is a great compliment to the fruity marshmallows, they’re amazing! 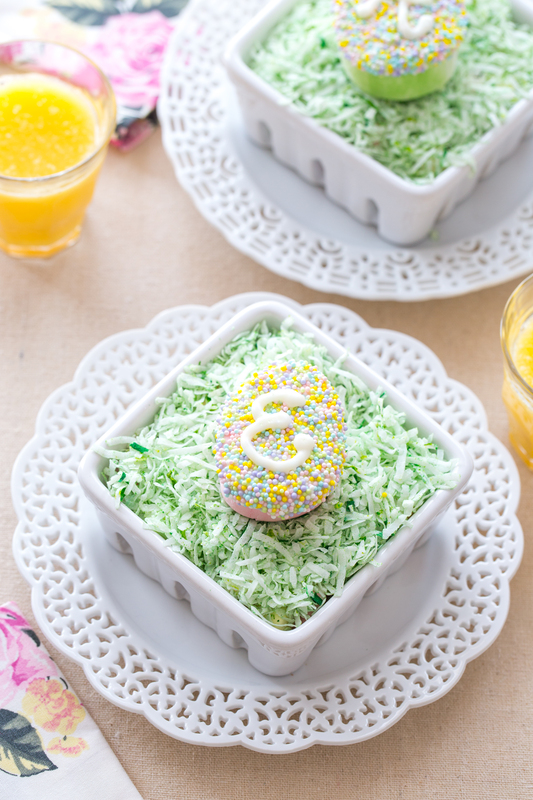 Instead of decorating them like little Easter eggs, this year I’m all about the sprinkles! I put them together with a simple place setting to create a quick and easy table decoration. I found these ceramic berry baskets at my grocery store in the Easter decoration isle, but you can use any shallow white dish (or wooden basket) that you like. I filled the baskets with mini marshmallows to create a soft bed for the coconut “Easter grass”. To make the green coconut “Easter grass” all you have to do is place coconut in a zip top bag, add a few drops of green food coloring, close the bag and shake until the food coloring distributes and turns green. 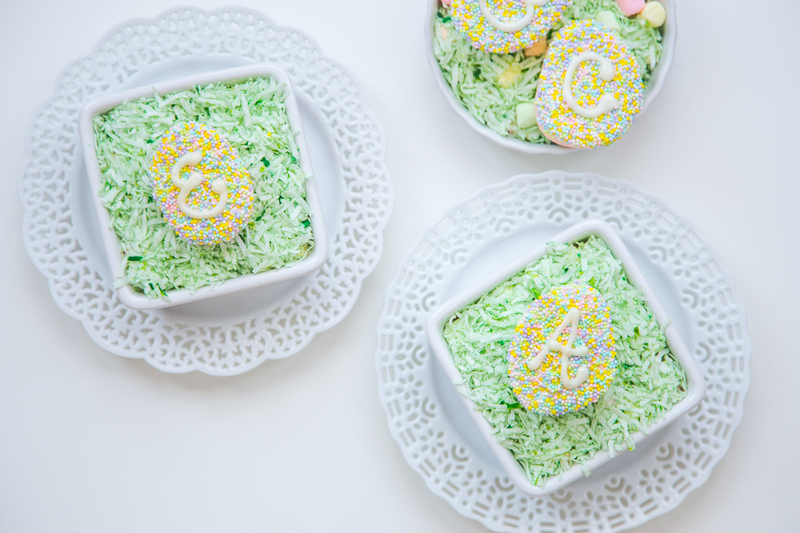 Sprinkle the green coconut over the marshmallows and top with a Monogram Marshmallow Easter Egg. Super simple plus, everything is edible! If you haven’t already, be sure to follow along with our Marshmallow Madness Pinterest board because it’s full of awesome recipe and craft ideas. If you are going into Spring break with your kiddos, you’ll want to check it out for some fun activities for the week. Happy Thursday and Happy Easter! Melt vanilla candy coat according to package directions (adjust the amount based on how many marshmallows you are making). Pour sprinkles into a shallow bowl. Dip one flat side of each Campfire® Eggswirler into the melted candy coat and then into the sprinkles to coat. Place sprinkle side up on parchment paper and allow to set. Repeat with remaining marshmallows (based on how many you'd like to make). Transfer extra melted vanilla candy coat to a zip top bag (or piping bag). Snip a small amount off one corner to form a piping bag. 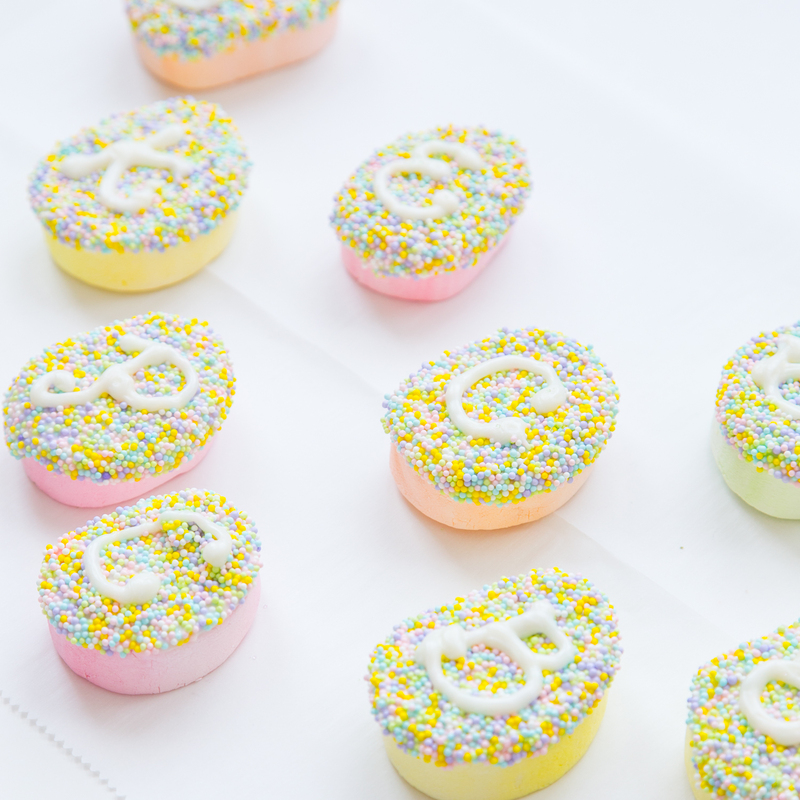 Pipe monogram initials on top of the sprinkles. Allow candy coat to set. Fill berry baskets with mini marshmallows to the top. Place coconut in a zip top bag and add a few drops of green food coloring. Close bag and shake until coconut is green. Sprinkle coconut over marshmallows for the "Easter grass". Place one monogram marshmallow Easter egg on top of each basket and use as place settings at your Easter table! These Easter eggs are looking great and delicious. From last few weeks I was searching for some dessert which I can prepare on Easter and here I got that.